When football resumed after the war Mr. William Robson, who had been acting as Secretary, resigned in 1946 to let Mr. Sanderson, who had returned from war service, resume the position. Following the postponement of the East of Scotland League during 1939-40, a new league was set up for the rest of that season consisting of nine army teams, with Netherdale No. 2 of the Light Infantry winning the championship. The first season after the resumption of football, in 1945-46, saw five sides – 11th Holding Battalion, Duns, Eyemouth United, Gala Fairydean and Peebles Rovers – contesting the East of Scotland League, with Peebles Rovers winning by a comfortable margin. More sides came back on board for season 1946-47 as clubs started up again after their enforced period of inactivity, although the season was hampered by an exceedingly bad winter. 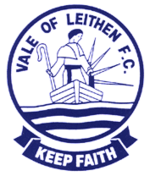 In many ways it was like reforming the football club and the Vale team was made up of local players, with a few from Peebles, and featured names such as Doherty, Currie, Eckford, Neil, McGinn, Tulloch, Keddie, Rathie, Cockburn, McLennan, Brunton, Lawrie, Haddow, Henderson, Aitken and Jackson. At this time Vale decide to have direct representation on the East of Scotland Football Association and East of Scotland League Committee and Mr William Murray was appointed to take over from Mr. D Liddle who had served for a number of years. Membership of the East of Scotland League once again began to grow, with Scottish League club Hibernian, followed by fellow Edinburgh giants Heart of Midlothian starting to field youth teams, the ‘Colts’, in the league. Perhaps not surprisingly, they began to dominate the competition. East of Scotland stalwarts Berwick Rangers were also elected to the Scottish League after winning their first East of Scotland championship in 1946-47, but left their 2nd XI in their place. Post-war, Vale found the going tough with an almost entirely local team and tended to feature in the lower positions of the league. The club did have a good season in 1948-49, finishing fourth in the league and winning of the East of Scotland Qualifying Cup. It was the only success of the 40s during which football competition had been severely disrupted, but kept up Vale’s record of winning a trophy in every decade.